ELIZABETH CITY, NC - Last night the 2016 Chevrolet Cruze was revealed to a crowd of auto-insiders, press and writers at the Fillmore Theater in Downtown Detroit. General Motors reveals the new 2016 Chevy Cruze is longer, lighter and gets 40 mpg from its 1.4-liter, four-cylinder Ecotec turbo engine. The 2016 Cruze will pull into dealerships in the spring of next year, and is currently the fifth newly designed model that Chevrolet has released this year. The goal for Chevy is restoring that reputation of ingenuity and excitement the brand had in 1950s and '60s. Since the beginning of the year, Chevrolet has unveiled redesigns for Volt, Camaro, Malibu and the Spark, and the reveal of the all-new 2016 Cruze was just as successful as the earlier models. 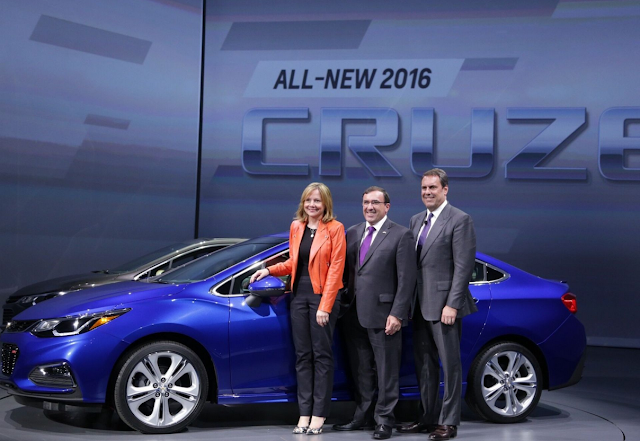 GM CEO Mary Barra was on hand and took the cover off of the new Cruze Wednesday night to the delight of those in attendance. General Motors reveals that the new 2016 Chevy Cruze will weigh in at about 250 pounds less than the '15 model, accomplished through a retooled aluminum engine block. This block is made by press-hardened steel, which is a process of heating steal blanks until they become malleable. Bumper-to-bumper, the new Cruze is lengthened by 2.7 inches, which gives 2 more inched of legroom in the rear-seat. As with it's other Chevrolet models, GM infuses the new Cruze with Android Auto or Apple CarPlay, which customers have the option of purchasing. A modern style theme, similar to that of the new Impala and Malibu, gives the Cruze a more premium look which John Cafaro, Executive Director of Chevrolet Design, says is and example of craftsmanship, content, quality and a fresh interpretation on an unmistakable Chevy identity. It will be an exciting day when the 2016 Chevy Cruze rolls into our dealership– we cannot WAIT to see it! If you would like to check out any of the other brand new Chevy models released this year, stop by! Perry Auto Group has two dealership locations to serve you better at 1005 W. Ehringhaus St, Elizabeth City, NC, 27909 or 1001 Halstead Blvd Elizabeth City, NC 27909. Feel free to call us with any questions at (252) 338-9100.